Working Saturdays means that any weekend entertaining needs to be planned and organised well in advance, especially when it comes to Saturday night barbeques at the cottage. The Naas Cousin was coming to stay so I grabbed the opportunity to get a few of the cousins together. There wasn’t anything complex on offer: free-range chicken drumsticks marinaded for a little while in my thrown together barbeque sauce (mix enough tomato ketchup, wholegrain mustard, cider vinegar, soy sauce and seasonings to coat the chicken. Allow to stand. Throw on barbeque. ), some decent meaty sausages, homemade mini-beef burgers and an assortment of roasted vegetables (red and yellow peppers, spring onions, large mushrooms with garlic butter and lemon, sweetcorn with smoked garlic salt). The Husband normally does the cooking outside while I look after the prep in the kitchen as there are always a couple of salads to assemble. This time it was a Pasta and Flageolet Bean Salad with Sundried Tomato Dressing alongside a Green Salad with Blue Cheese, Nectarines and Savoury Seeds, dressed with Sweet Blackberry Vinaigrette. 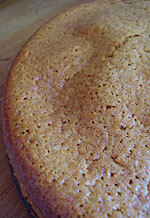 When making the Caramel Cake, I didn’t have any cream in the house – again! – so I give you my less rich version of Tessa’s recipe, which uses extra milk instead of the cream. This keeps exceptionally well but make sure you don’t pull the caramel off the heat too soon. If it has been cooked until it is a lovely dark chestnut colour then it will have notes of bitterness to offset the sweetness all around. Preheat the oven to 180ºC (160ºC for a fan oven). Butter and flour a 24cm spring-form tin. Heat the sugar in a deep, heavy saucepan over a medium heat, without stirring, so that it melts and turns a deep chestnut colour. This will take some time but don’t rush it, just tilt and swirl the saucepan every so often so that it cooks evenly. When it is dark enough, take it off the heat and whisk the milk into the caramel, very carefully. If there are still lumps of caramel in the mixture, heat gently, whisking all the time so that they melt. Allow to cool for 5-10 minutes. Using a wooden spoon or hand held mixer, beat the butter in a large bowl for a minute, then pour in the still-warm caramel milk and whisk together. Add the vanilla and eggs, one at a time, whisking well after each one, and continue to whisk until the mixture cools a little and starts to thicken. Sieve the flour and baking powder over and mix well. Pour into the prepared tin and bake for 30-40 minutes until golden and firm, but still moist inside. Allow to cool on a wire rack before removing from the tin. Cuts into 16 thin slices. Adapted from Piri Piri Starfish by Tessa Kiros.